The record office occupies a former rectory which was later a theological college. A rectory existed here by the 1660s. If you look westwards, you’ll see that the rector didn’t ha ve far to walk to take services at St Deiniol’s Church! The oldest part of the current building probably dates from the 18th century. 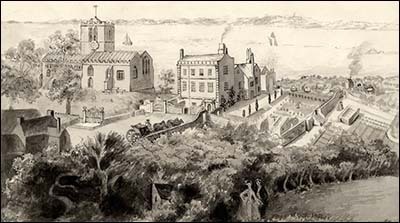 The drawing on the right, by Thomas Boydell, shows the rectory and its formal gardens in 1756. 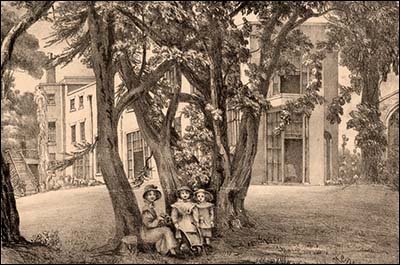 The drawing below is by Lady Charlotte Neville Grenville, daughter of the Earl of Dartmouth. She married Hawarden rector George Neville and lived here 1816-1834. Both drawings are shown here courtesy of Flintshire Record Office. In 1746, Thomas Fisher attacked the vestry clerk, Edward Thomas, outside the rectory. There was a “great effusion of blood” from the clerk. As parish clerk, Fisher had planted three trees at the sites of Christian crosses in the village, but by 1746 he’d lost his job after complaints from parishioners. The Rev Henry Glynne, rector of Hawarden, was killed by a lightning strike in 1872, aged 62. In the search room is a brass plaque commemorating the death in that room of Dr Edward Benson, Archbishop of Canterbury (head of the Anglican Church). On a weekend visit to Hawarden, he was taken ill in the church on a Sunday morning in October 1896 while sharing a pew with former Prime Minister William Ewart Gladstone and family. He was carried to the rectory but soon died. He was buried at Canterbury Cathedral. In 1925 the Church in Wales, then recently disestablished, moved the rector’s accommodation to a house named The Sundial, former home of educationist Helen Gladstone. The former rectory received a new south wing, with the bow windows which face you as approach the record office, for its new use as a college for men who wished to become Anglican priests. The college moved here from Knutsford, Cheshire. The building was a home for infirm and blind evacuees from Birkenhead during the Second World War, with the college relocated to Hawarden Castle. After the war it became a college of theology and sociology for women. It has been the home of the county record office since 1956, holding thousands of documents from the 13th century onwards.